I am very excited to announce that the next Live Author Chat Night will be with the loverly Christy English!! 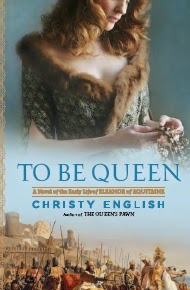 Please join us on Tuesday, April 12th from 6:30 - 7:30 pm EST to talk about Christy's sophomore release, To Be Queen: A Novel of the Early Life of Eleanor of Aquitaine !! Participants will be entered to win a really cute To Be Queen coffee mug and will receive points towards the To Be Queen 2 signed copy giveaway that will be starting later today. All corresponding (questions and answers) will take place in the comments section of the Chat Night post (not this one). I will start off the Chat Night with a welcome message and a question or two to get the ball rolling and then the floor is open to whomever has a question for Christy. I can't wait, Amy! We will have such a good time...thank you for hosting me! I am looking forward to it. Hopefully I'll remember to check my calendar. I'm really going to try to make this one. Hopefully, I can work something out with my husband's schedule. All of your books are beautiful. I remember reading a few of Rosalind Laker's older books. Didn't know about The House by The Fjord. I am dying to read The Bird Sisters. Each book is just a wonderful one.